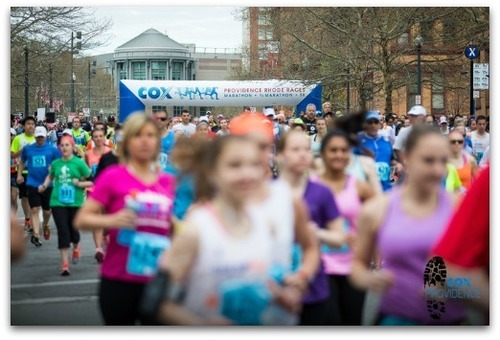 "The 2015 Cox Providence Half Marathon"
The date of this race just so happened to fall on the 3-year anniversary of the first half marathon my mom and I ever ran – the Twin Lights Half, so it already felt pretty special. The two PR’s my mom and I ran were just icing on the cake. Let me back up to the beginning though. My mom and I got up bright and early to make the drive down to Providence, armed with travel mugs of coffee. We got to see the sunrise during our drive and the roads were empty, so that part was pretty much smooth sailing. Things got a little iffy when we reached Providence and found that the roads we were supposed to go down to reach our planned parking lot were already blocked off. Luckily we were able to find another public lot with plenty of spaces only a few minutes later. We then made our way to the Omni Hotel to pick up our bibs and race packets. I don’t often criticize races, but I have to say this part could have been A WHOLE LOT more organized. The place was mobbed with runners, but there were no signs directing where to go. After some confusion, we found the room that was holding the bib pick-up, but again – there were no signs for where runners were supposed to line up for marathon, half, or 5k bibs, there was just one long, snaking line. After circling the room a couple times trying to figure out where to go, we finally got our bibs and shirts (at least, my mom did. They were out of ladies' medium shirts, so no shirt for me). Not a great start. We got out of there as fast as we could and made our way to the start area where the marathoners were preparing to leave. Luckily, we had plenty of time to use the porta-potties (which there were plenty of, thankfully! ), warm-up, stretch, AND take some selfies. The marathoners were scheduled to start at 7:30, but didn’t end up heading out until probably 15 minutes later; we were told this was because of a small car accident along the course. Finally, the National Anthem was sung and they were off! Now it was our turn to line up in the corrals, self-seeding ourselves near the appropriate pacer. My mom and I lined up near the 2:15 group, not wanting to go out too fast. After what seemed like ages of waiting, we were finally off! The first mile or so of the race was a nice downhill and I tried hard to rein myself in. My first mile split was 8:51, a little faster than I had intended, but I felt very comfortable, so I would attribute that to the downhill. For a course that was described as “relatively flat”, it sure seemed to have a lot of hills! It seemed like every mile to mile and a half, I was reaching these long, gradual inclines. I tried to maintain my effort, noting that my pace would often drop to 9:00/mile on these inclines, but not letting myself worry too much because I was still feeling great and doing an excellent job keeping my pace between 8:40-8:50 on the flats. For the first 10k, my average split was right around 8:48. At this point I was pretty confident that I could run this race under 2 hours (what a huge difference for me from my last half! ), but I wasn’t sure I could beat my PR of 1:55. I wasn’t worried though. Honestly, I was just having a blast running this race. I tried to soak in the gorgeous scenery – trees in bloom, beautiful houses, some gorgeous views along the river, even snapping a few photos with my phone. Around miles 7-9, we ran past a park where many spectators had gathered with signs. Tons of little kids lined the streets with their arms outstretched for high fives – which I happily gave as I ran by. The crowd support was totally awesome and much needed, as my stomach was feeling a little crampy by this point. Around mile 10, I looked down at my watch and saw that my PR was within reach – but it would be very close. I finally decided to push the pace for the last 3 miles. Whatever happens happens, I thought. In my haze, I couldn’t figure out the actual splits I would have to run, so it was more of a ‘Run as fast as you can and hope for the best’ plan. Mile 11 – Another freaking hill. I slowed down a bit, but I was passing runners right and left. Mile 12 –This one HURT. I felt pretty comfortable through the whole race, except for here. Still, I’m glad I went for the PR. Mile 13-13.2 – 8:12 for a final chip time of 1:53. I think I was about as excited for my PR as I was to just finally stop running at that pace. Two miles never felt so long. After grabbing my medal and a bottle of water, I was doing some stretches, keeping an eye on the finishers when I spotted my mom, cruising in with the clock reading 1:59 – ANOTHER PR and her first time breaking the 2-hour mark!!! What a way to complete our New England states and celebrate our 3-year anniversary of half marathons. 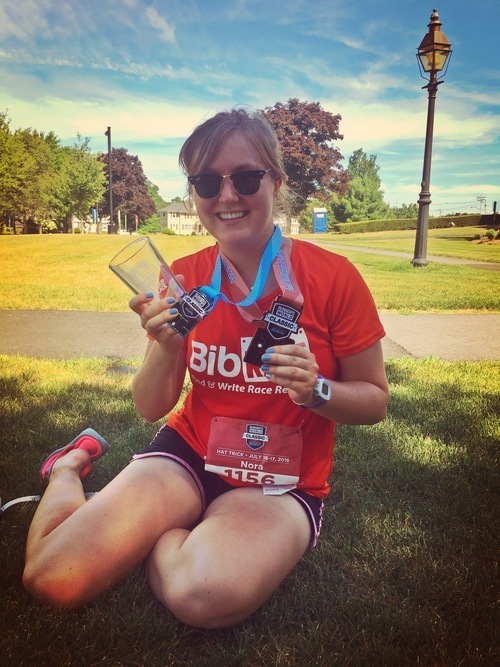 The food at the end of this race was not particularly special – bananas, mini Clif bars, and pizza – but there was a vendor selling fresh veggie juices, so we both tried a kale, cucumber, orange blend, which was delicious! All in all, not a bad race, but also nothing super special. If you're looking to just get a race done in the state of Rhode Island, there are probably some better options. "The Clearwater Distance Classic - Beautiful Views, Surprisingly Difficult Terrain"
My mom and I were both excited to run this race, having not run a long race since the Rochester Marathon in September. Right at 7:05 the gun sounded, and everyone was off! And I mean, everyone. This race offered a 50k, marathon, half marathon, or 5-mile distance, and everyone started at the same time. This made it a little hectic and crowded at the start, but not terrible. Everyone just seemed happy to be running! The race took us into the edge of downtown Clearwater, and then across the first much-anticipated bridge! On the website, they described this as possibly Florida’s most challenging half marathon because of the steepness and difficulty of these bridges, which provide great views of the Gulf of Mexico and Clearwater Bay. Being from hilly New England, my mom had scoffed at this. “Bridges?! How bad can they be?” Well, pretty dang steep to be honest. The only good news was that the first one came somewhere around mile 2, so we still had plenty of gas in the tank. The views from the bridge were wonderful – all sky and ocean and impressive silhouettes of the hotels in the distance. Once we crossed the bridge, we started seeing signs for Hope and Winter – the famous dolphins from the Dolphin Tale movies who live in the nearby aquarium. One runner shouted out across the bay area “HI HOPE AND WINTER! !” :) There were also jokes about all the beeps from GPS watches being understood by the dolphins nearby. We passed some beautiful beaches, finally reaching the turn-around point in this out-and-back course. Once we finished, I grabbed my medal (which is actually one of my favorite medals ever - love the happy, smiling starfish!) and went with my mom to check out the post-race food! There was a good selection and we helped ourselves to chocolate milk, pastries, pretzels, and bananas. There was also pasta available, but neither of us really wanted that after running for 2 hours. Other Notes - The expo is pretty small, but outdoors, which was kind of fun. I also really liked the longsleeve cotton shirts we got. Not great for wearing running, but perfect for hanging out on a lazy Sunday. The weather was perfect when we ran - cool in the morning, but sunny and warmer as the race went on. Overall, the views make this race pretty special and definitely worth signing up for!